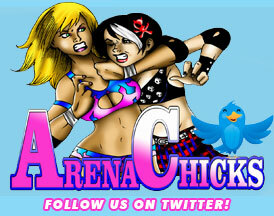 ArenaChicks.com » Blog Archive » Thank you Wilmington, NC! Everyone at ArenaChicks would like to thank all the people that attended the Cape Fear Tatoo & Art Expo this past weekend. We had such a great time meeting everyone and a big thanks to everyone cheering during our live wrestling exhibition! Also a big thanks to our stellar cast of ArenaChicks! Here’s picture from our booth and we look forward to returning next year! I really enjoyed meeting all the ladies at the Arena Chicks booth and even though I was one of only a handful of wrestling fans there to watch the two matches, it was cool. It seemed like the folks who were there for the tattoo con enjoyed watching, too. Amber G, Amber O, Cookie, Angel, Sumie, Annie, and Shelly, thanks for a fun afternoon !